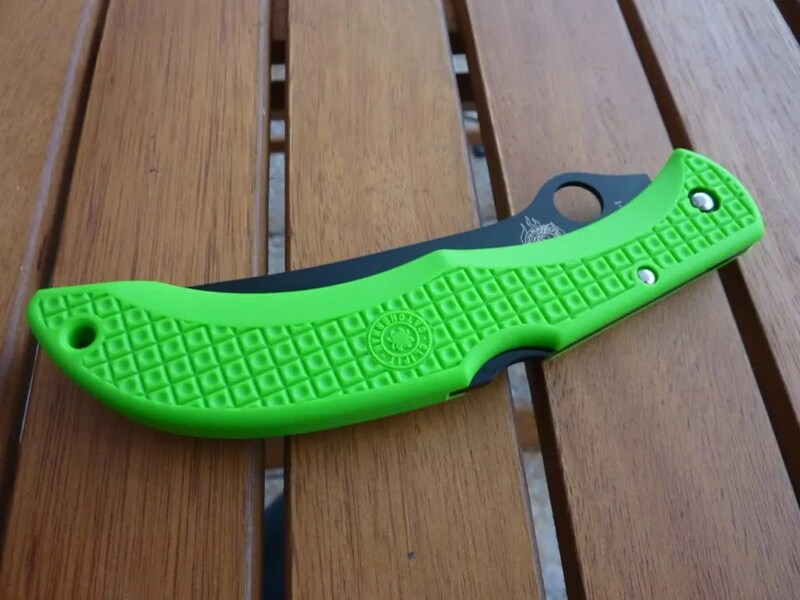 Spyderco Catcherman USN Edition in H1 – Green Power ! In my quest for a travelling knife, I’ve been considering a lightweight big folder. 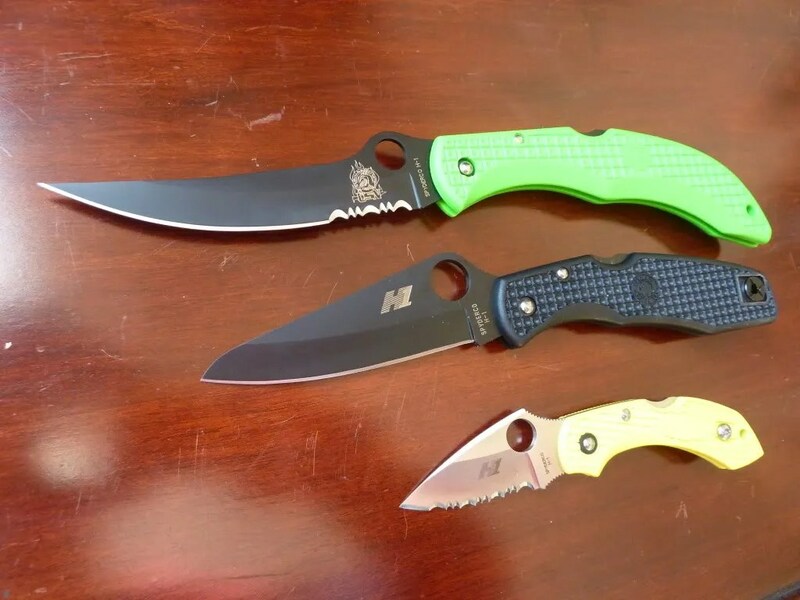 I already know and appreciate the Cold Steel Voyager Serie and also I’m a big fan of the Spyderco C36 Military. Then I got the chance to purchase a sprint run (600 ex.) of the Spyderco Catcherman for USN forums. First it was the chance to handle and own one of the most extreme concept ever made by the Golden crew. The C17 Catcherman was designed as “a filleting tool for the serious fisherman” and offered a long and thin AUS 8A Steel blade. 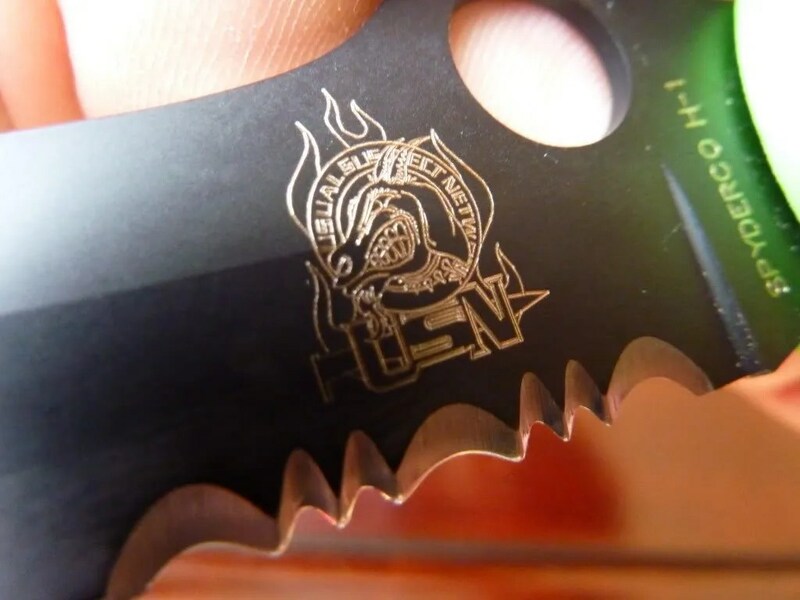 Now imagine this very serious and gentle tool Evil Twin: the USN Special Edition. With its black blade (titanium carbonitride coating!) 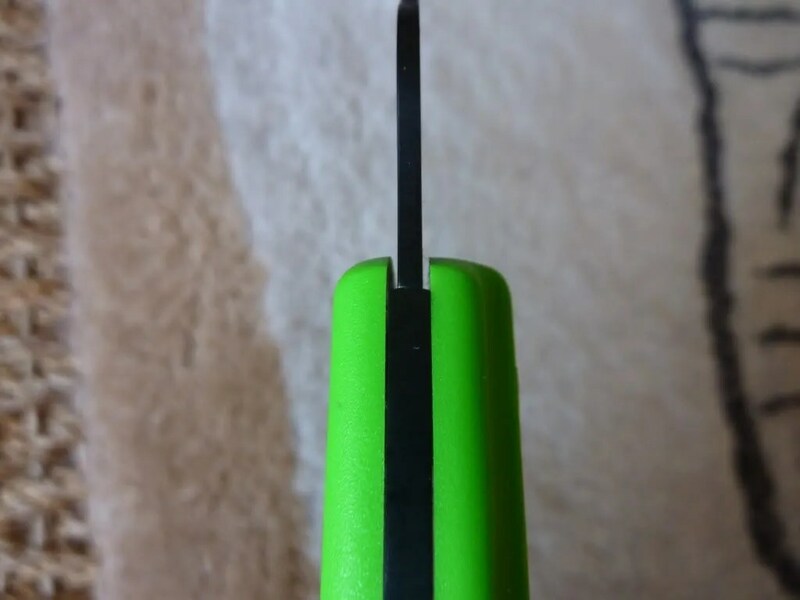 and partially serrated blade and toxic green handle (the official color of the USN…) the folder filleting tool could be now…a great toy for Dexter Morgan !!! OK, but now looking at it, this is still a very serious folder and a wonderful travelling companion. 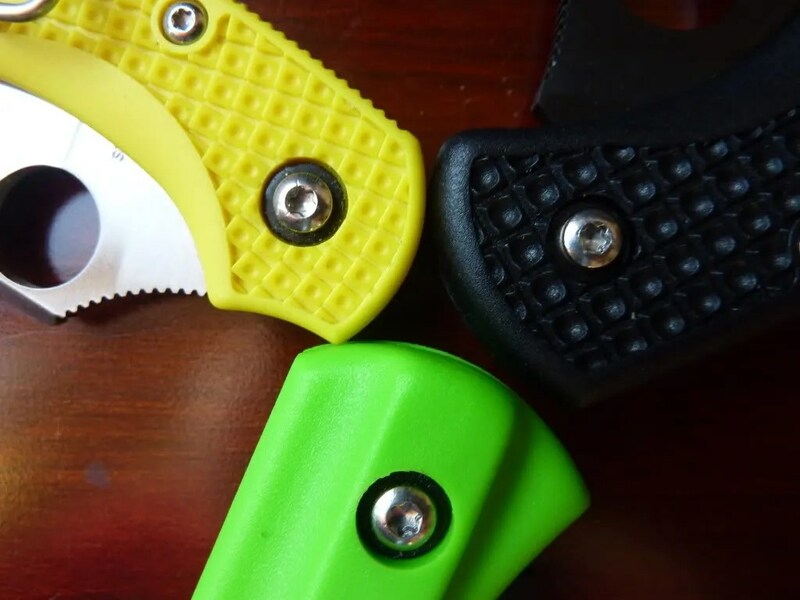 First of all, that toxic green handle is perfect to find your knife in the bottom of your bag, boat, drawer. 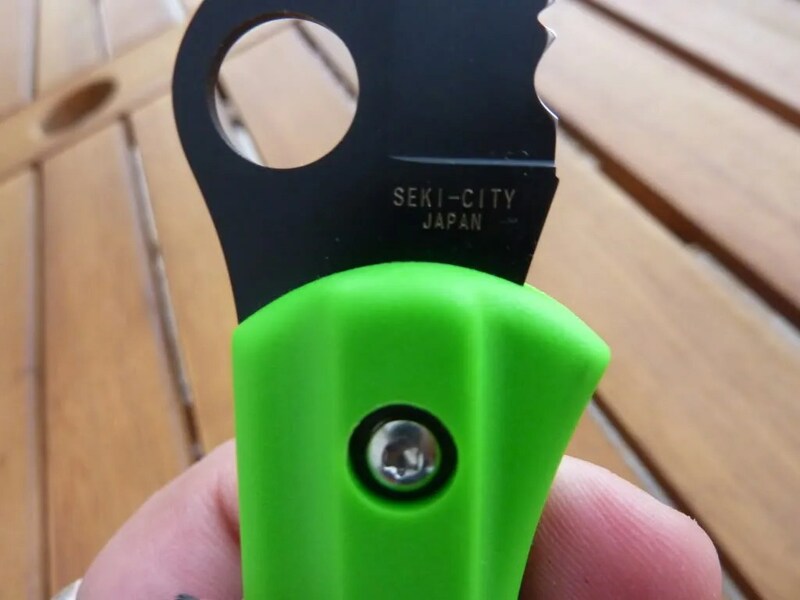 It gives a green Stabilo look to it once its clipped to your pocket (the clip tip up right carry is integrate to the handle and is as green as the rest for a .) They are serious improvements as it’s now a Salt knife. It’s very easy these days to find a lot of review on the new Salt series by Spyderco with their H1 blades. Started with the Salt 1, a modified Delica 3 with a bigger hole in the blade and a stronger tip, it features a steel impervious to corrosion. ‘H1’ is a self hardened steel with 1% amount of nitrogen. Don’t ask me why this alloy matrix does not want to have an affair with our atmosphere’s oxygen. I don’t know ! But it works great and it does no rust or stain in salty environnement. From South African hunters to Bali’s divers, the folder are following their owners without piting. So fellow outdoors men (not only fishermen or sailors) you can expect from a Salt knife the relief to be able to use a sharp tool without to mind about cleaning it after. 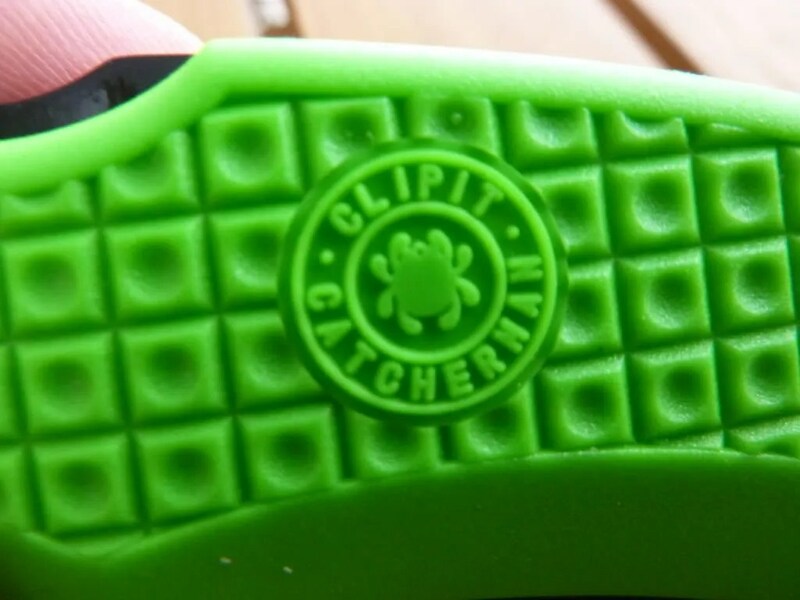 Your Catcherman from the blade to the clip is purely rustproof. And H1 Steel performs quite well. I head once that the very edge on the plain edge version is 65 HC Rockwell and 68 on the serration (due to the grounding of the serrations). Now opening the C17 USN version and you got a thin and long blade beautiful. This is the thinnest blade of all the H1 knives I own and know. To quote Sal Glesser in the Spyderco Story Book: ” The blade was thinned out more than normal and if you look at the top of the spine near the pivot area you’ll see that the lock is actually thicker than the blade.” It was true for the original C17 it’s also true for the C17 in H1 and like many qpeople thought: this is not a flaw, this is part of the design. Also there is now a little improvement: the pivot is a screw giving you the option to tune the tension. Mine came with no vertical neither horizontal bladeplay. Why a half serrated version when the original C17 only came primary in full serration or plein edge ? Again the answer is in the Spyderbook: “The combination edge gives you enough serration so that you can cut a bone with the small section of serrations near the handle.” Cleverly the C17PSGRBK kept just enough serration to be very useful. It’s for example so easy to cut a line caught in the H1 teeth and there is still plenty of plain edge for other chores on the shore. For what I know about H1, even with a thin edge, it has been impossible to chip the edge. It can roll though. Another good point for the H1 is for cooks. Who has ever cut and prepare a lettuce with good old carbon steel knows that simple fact: the green leaves will turn black in 9 minutes! With VG 10 and stainless steel for example you need to wait for 4 hours before ruining your dish. H1 should be more delicate with food contact. This is something I have been testing with excellent results. Delicate food is delicatly treated. This is also where the Catcherman shines: in the kitchen. Melons, for example ask for a longer blade than your usual EDC, but also pinnaples where the thin blade of the C17 is vorpal. Again, the acidic juices are not a concern: H1 protected by the coating is impervious to blood, sweat and tears usually able to dull a carbon steel edge in 10 minutes. Also carving any cucurbitaceae for halloween is now a childplay. My C17 came razor sharp and as I not destined it for cardboard or whittling wood, it’s still (almost) razor sharp after 4 monthes of constant and regular use. Of course chicken and turkeys are no match for the thin black blade and after rinsing it under the tap you can pocket it without to worry about it. So yes, really this a knife which becomes quickly addictive especially in moist environnement from the kitchen to the sea shores. 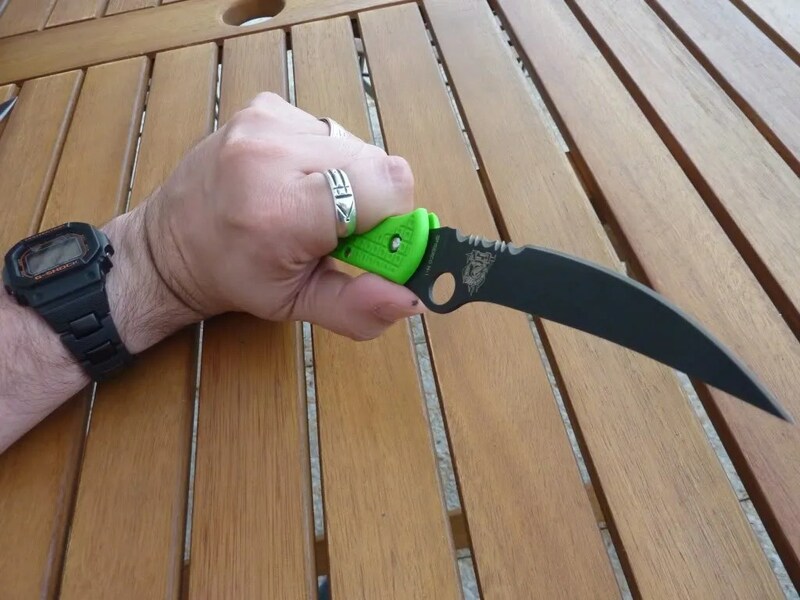 As I really prefer to scuba dive with my Salt Pacific or eat with my serrated H1 Dragonfly (both reviews will come next year), the Catcherman is one of my “carried in the bag” knife and it’s the knife wich goes with me when I’m sailing or daycruising. In the galley of a ship, it’s great to be able to fold your cutting tool after use. This is a great safety inside a boat where everything rock’n roll in every direction. Conclusion: new and limited edition in the Salt series, the C17 was always IMHO destined to be mounted with H1 steel. 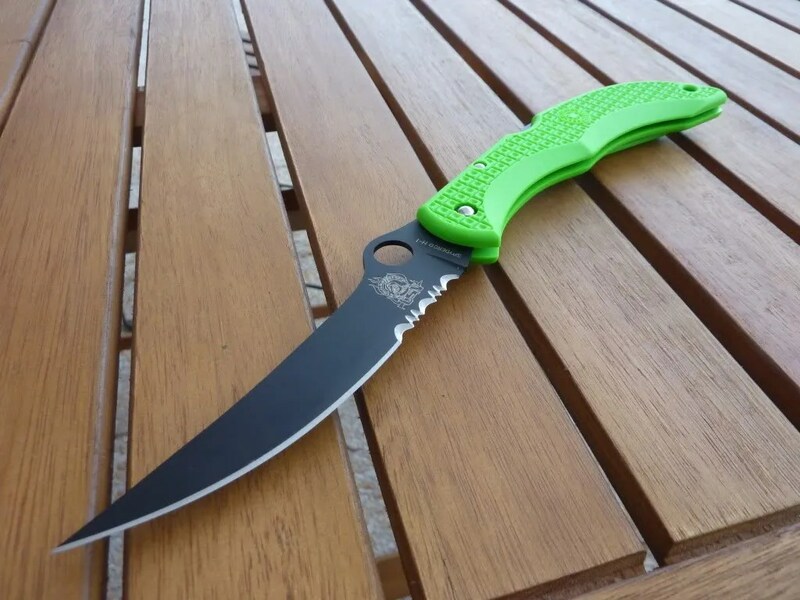 I even hope Spyderco would make a regular Salt Version for the serious fishermen around the world. This is a fruit/meat processing knife and if used properly (no scaling, battoning, shopping, throwing…) you will be very surprise in how usefull it will be. There are not a lot of 4,75 inches thin pointy blade folders around and this makes it a high performance reliable companion. Frankly the Catcherman was really *not* the knife I would have bought until I hold it in my hands. And… Once open it’s light but also perfectly balanced. Very ‘handy’. Very serious. I immediatly figure how useful it could be and eventually it has proven to be really a great knife for food and meat preparation. But again, the Catcherman is so great once put in use… the black blade, the grinning goat logo and half serrated blade… True, it’s almost like a ‘caricature” of a ‘tactical’ folding knife which makes it immediatly sympathic to my eye and strangely… very sheeple friendly. (‘Oh, it’s green!!!’. Yes it is.). Makes me think about a clown in a circus. You know clowns got a lot of flashy colors and strange “over the top” gear, like very long shoes for example. Like the clown there is a long story of labour and courage behind the make up. To be a clown is not the easiest job in the circus: you need to be a good acrobat (means your fitness needs to be at the top always), you need to be a musician (good enough to improvised on every tune and to be an multi-instrumentalist too.) and you need to be a good comedian. Really, this knife make me smile everytime I open it. In a very good way. Yes, Yes, Yes, Nemo I aggree with everything in your write-up. This is a great working knife and with the versitality as you discribe it, it is hard to beat when it comes to fillet work and foodprep. Altough, the Catcherman is one of the “old style” Spyderco models, it has not lost any of its initial panache and bravery. This tool works where ever you take it ,especially in and on the water! Your pictures are very good and your obeservations and experiences are all true and relable. I like it and I hope that many more readers will react to what you write. Also the Spyderco Book is a huge vault of specific information and should be a must read for all Spyderco lovers! Thanks for a great read and report! 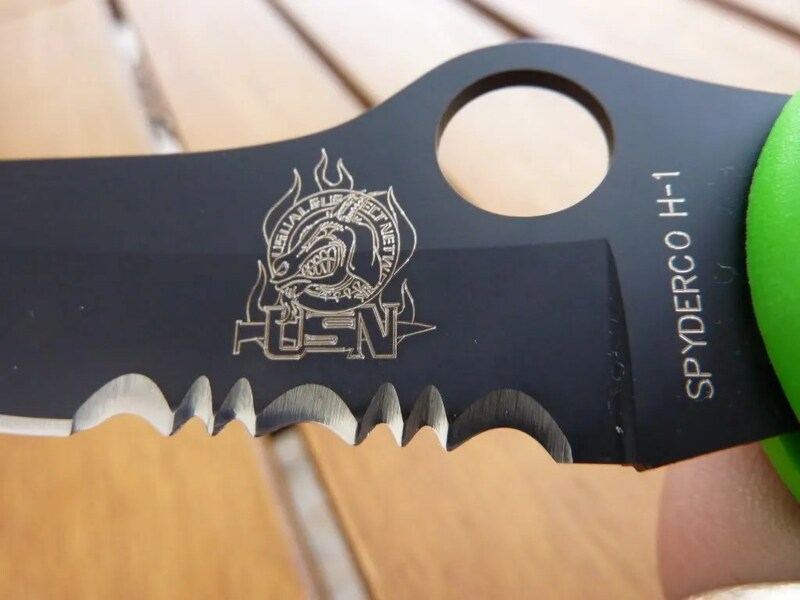 An interesting take on a special knife. Great review and nice, clear pictures! Thanks Nemo! Another great review! That comment about the ‘stabilo look’ when the folder is clipped to your pocket certainly rings true. I must have plenty of those markers lying around. Hi, thank you for very cool review. Do you where I can buy c17psgrbk H1? Non available at the moment. Next Next post: Voyager XL Clippoint. This is for real.